The sun is shining, the bees are buzzing, blossoms abound, and the barbecue’s been dusted off and rolled onto the deck. It’s that glorious time of year again – grilling season! 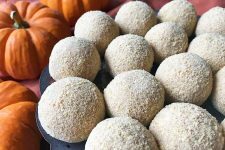 Sadly, it’s also the time of year when many of us realize that the old model isn’t going to make it another month – never mind lasting until Thanksgiving. But, not to panic – we’ve got you covered. Foodal’s already explored portable charcoal barbecues, compact gas barbecues, and backyard charcoal grills. We’ve even helped readers to make the choice between gas or charcoal. So, what are we going to cover in this article? Well, we’re serving up all the info you’ll need to make an informed choice for a full-size, outdoor gas grill. Outline the differences between liquid propane and natural gas. Give an overview of how infrared systems work. 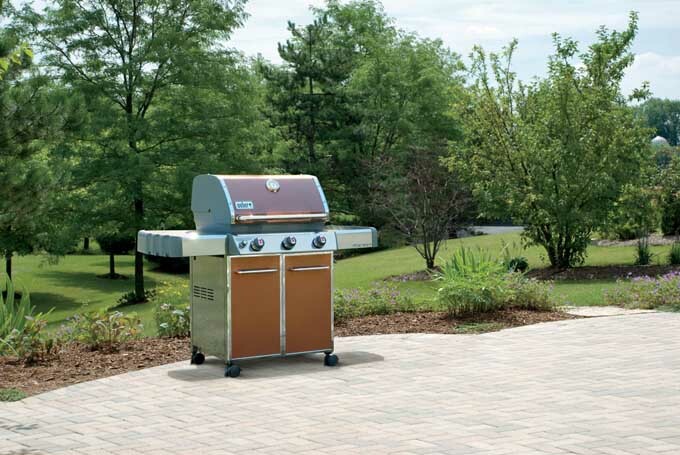 Determine the features to look for when shopping for a new grill. 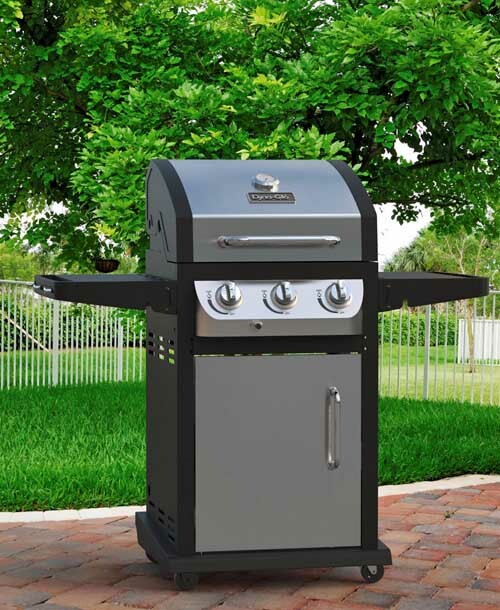 Provide you with our top recommended gas BBQ grills. 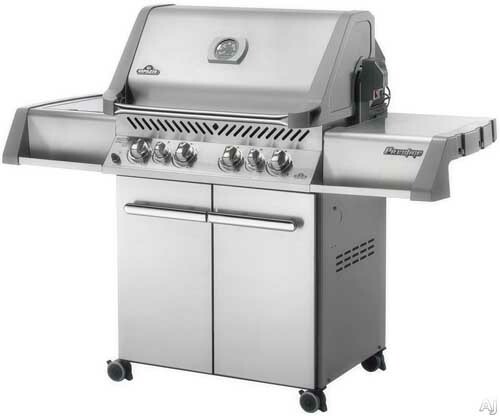 With gas grills, you have the option to use two different fuel types, liquid propane (LP) or natural gas (NG). 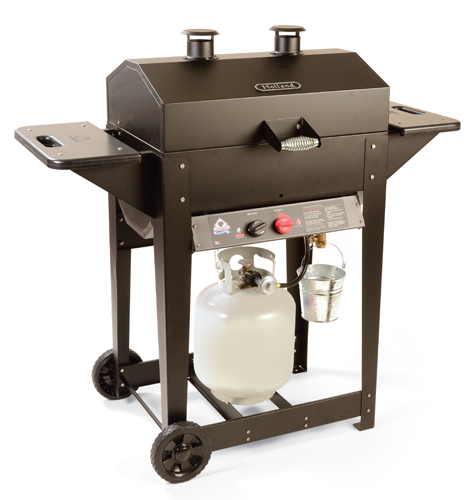 For full-sized models, liquid propane comes in 20-pound tanks that hook up to the barbecue with a hose and regulator. The tanks reside below the firebox on the ground or on a shelf, and can be moved about when the grill is rolled to a new spot. On the other hand, natural gas is fed to your barbecue via a hard line, a feeder that comes from the main gas line to your house. Your grill has to come to the line, which is not movable, so this makes built-in grills a good choice for natural gas. However, some cart models will come with a natural gas hose, so that the unit can still be moved in a limited range. And while some full-size LP models have the capability of adapting to natural gas, not all will have this capability. There are benefits to both types of fuel, but neither is inherently superior to the other. With LP, you can take your tank to a refill station for more fuel, and you won’t need more than a short hose and regulator to hook up your tank. With NG, you need to have a certified gasfitter install the line, so you don’t accidentally blow yourself to smithereens. Of course, with natural gas, you’ll never run out of fuel mid-barbecue. The online Encyclopedia Britannica tells us that one British Thermal Unit (BTU) is the amount of energy that’s required to increase the temperature of one pound of water by 1°F. And in relation to barbecues, the number of BTUs can be a bit deceptive. Manufacturers sometimes encourage us to think that higher numbers of BTUs will generate more heat. In truth, the number of BTUs tells us the quantity of fuel the BBQ can consume to heat the grate area in an hour – and the larger the grill, the greater amount of fuel will be needed to heat the area. A more indicative number for heat transfer is BTUs per square inch per hour, also known as heat flux. This gives a better indication of the grill’s heat delivery capacity – or the ability to give a good sear. To calculate heat flux, divide the BTUs by the area in square inches for the primary cooking surface (but don’t include side burners and warming areas). This doesn’t take into account air leakage from the fire box, how close the burners are to the grate, and so on – but it does give a better idea of how well-seared those delicious T-bones are going to get. We’ve also included the heat flux for each of the models reviewed below, which comes to an average of 79. And that includes a very low number for a slow cook/steamer model. Without the slow cook/steamer model, the average is 85 – which is a good number to base your searing requirements on. Basically, heat flux is an escalating scale, so the higher the number, the more efficiently heat is delivered to the cooking surface, with high-end models ranging from 85 up to 100. Standard gas grills use convection heat, or the flow of hot air, as the primary source for cooking. Conduction, the transfer of heat from the grates, is a secondary heat source. 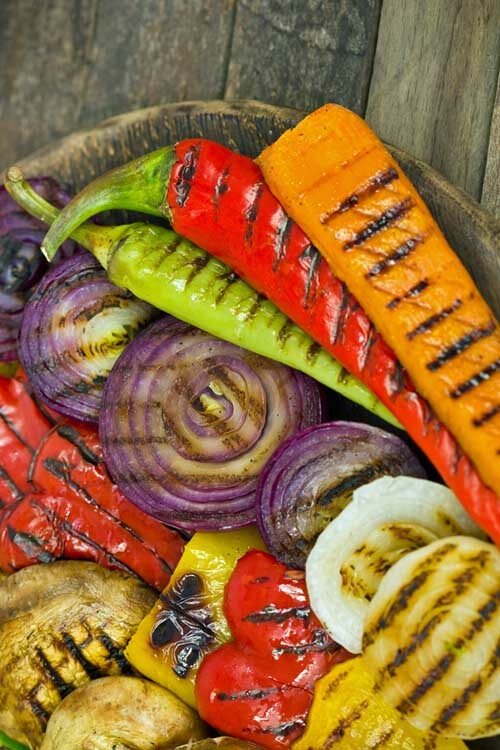 In recent years, the use of infrared heat has been making a splash in the grilling world. Weber calls their infrared system “flavorizer bars” and they fit over the burners keeping the food out of direct contact with the heat as can be seen on this excellent Weber Genesis E-330 model. On the electromagnetic spectrum, infrared is a wavelength that’s right beside visible light – and infrared grills use radiant heat for cooking.An emitter plate with a coating of ceramic, glass, or stainless steel sits above the flame to absorb and amplify the heat, which is then radiated to the grate and the food above. They’re capable of much higher, intense heat levels than convection, often as much as 1,800°F. This is superb for browning and searing, and locking in flavor. 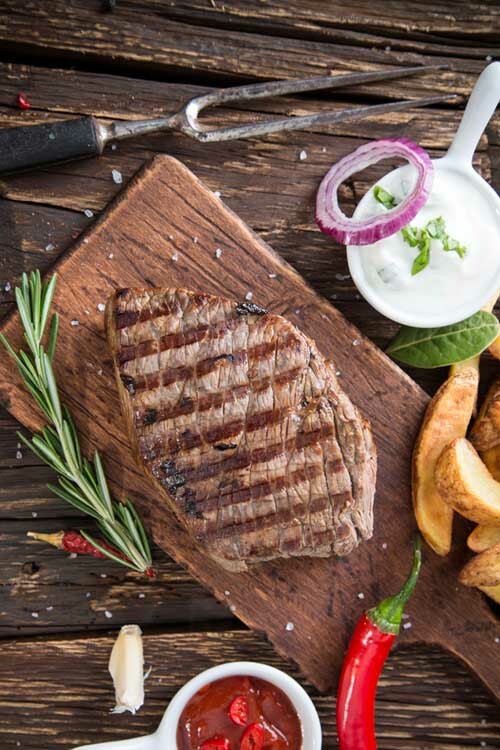 Because there’s less hot air flow, moisture loss is reduced – which means juicy, moist meat. Due to the intense heat, there are less flare-ups, as drippings are quickly incinerated. 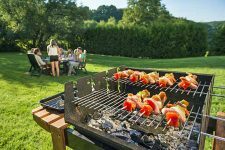 Aside from the emitter plates, infrared barbecues use pretty much the same technology and fuel as gas BBQs, and many of today’s models will offer a combination of infrared and standard burners. When it comes to barbecues, quality of construction and safety go hand in hand. This is why, in our reviews, we always look for the highest levels of quality in the materials, construction techniques, and ease of use for the home shopper – in a range of prices from budget through to high end. We’ve paid careful attention to all the features that give the best value. And we have compared dozens of brands, looking for all the aspects and attributes that provide the greatest enjoyment of use, and satisfaction in results. Plus, for your convenience, we’ve also culled all the wannabes that don’t make our grade in terms of value, quality, customer service, or safety. Because, really, who wants to drive from store to store on a sunny spring day to comparison shop? Or spend precious time trying to find a knowledgeable sales rep, or hire a forklift to get the box out to your car? (If it will actually fit in your car…)? A grill needs to be manufactured so that all components fit together to provide a secure, stable, and safe working environment. Seamless construction and welded joints in the cookbox offer greater longevity and efficiency (i.e. less hot air loss) than ones held together with nuts, bolts, and cotter pins. A well-fitted lid will be another factor in heating efficiency, as heat loss through gaping edges will increase cooking times. A higher price doesn’t always mean that robust materials have been used. And in any price range, the better the quality of all the materials, the longer a grill will last. A firebox of stainless steel or powder-coated, heavy gauge cast aluminum gives greater rust and corrosion resistance than painted steel or thin, stamped aluminum. Wheels need to be large enough to handle the size of the grill in order to provide a stable foundation, and to be easily moved. And ones with a full axle aren’t as likely to pop off as those that are simply bolted to the legs. Grills with unfinished edges or sharp metal corners can give nasty cuts, or inadvertently hook onto loose clothing – definitely a safety issue. To prevent knuckle singeing, the handle needs to have adequate clearance from the lid, to provide a safe and secure purchase. For the healthiest grilling, flare-ups need to be kept to a minimum. 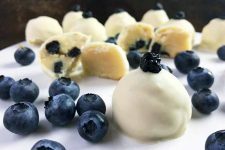 Some manufacturers now include deflectors, or flavorizer bars, that prevent fat from dripping onto the flames, which reduces the chance of flare-ups. This is important, because flare-ups cause charring of proteins, which creates compounds known as HCAs (or heterocyclic amines). These HCA’s can cause destructive damage to our cells, and are known to be a factor in human cancers. Few things are as frustrating as partially assembling a large item like a grill, only to find that important pieces are missing. If issues do arise, being able to contact customer service easily – and getting an efficient response – is mandatory for satisfaction. These are the one component that’s replaced most often, so look for high-quality materials in their construction. Stainless steel, cast iron, cast aluminum, brass and even ceramic will last longer than stamped aluminum or plain steel. The 3 stainless steel Dual-Tube burners and the Flav-R-Wave cooking system on the Broil King Sovereign 70 Gas Grill provides 44,000 BTU of indirect heat, allowing you to get a proper sear. And a good burner warranty is another indicator of longevity (10 years for burner replacement shows high confidence in the materials used). With any size grill, you want a minimum of two burners, which is essential for two-zone cooking. The ability to have both direct and indirect heat zones allows you to slow roast a large piece of meat, and cook your veggies or other pieces of protein in the second zone. This way, everything’s ready at the same time. A side burner is another helpful feature for holding cooked pieces or keeping a sauce warm. This is an element of construction that should also get some attention, as these come in a few different metals with different life spans. Aluminum or chrome-painted wire are lightweights, and will quickly disintegrate with normal wear and tear. Stainless steel and cast iron are both sturdy materials with a good life span, and both will give good, strong char marks. Stainless steel and cast iron also come with porcelain coatings, which make cleaning easier, and there’s no need to season enameled cast iron grates. Piezo electric ignition – in which a spark is generated by friction, and an electrode lets the spark jump to the gas. These are typically a push button style that gives an audible “click” when pressed, or a rotary dial. Battery powered electric ignition – powered by a AAA, AA or 9V battery, these give a hot, ready spark, and spark more reliably than piezo ignitions. Hot surface ignition – a small rod is super-heated by an electric current to glowing hot, resulting in ignition of the gas. Usually found on high-end grills, they also involve more complex wiring and are not as easily replaced as the first two systems. Ones that are built into barbecues are of notoriously poor quality, even on higher end models. Often located on the lid, the indicated temperatures can vary widely from the actual temperature on the grate. Lid mounted thermostats reflect the air temperature in the lid or dome above the cooking surface, and can often be as much as 50°F cooler than at the grate level. 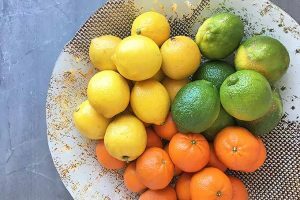 That is, unless you have deflector plates in your barbecue – in which case heat will be driven up the sides of the cookbox, creating a dome temperature greater than that of the grate area. Basically, the longer you leave your lid closed, the closer the temperature display will be to the actual temperature of the cooking area. But each time the lid is opened, hot air escapes, throwing temperatures off again. For the sake of your sanity (and health), invest in a decent quality BBQ thermometer to test the progress of what’s cooking. They’re inexpensive and far more reliable than the cheapo ones installed on grills. 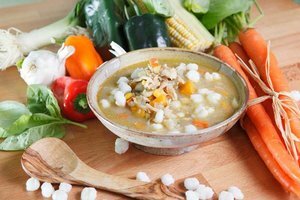 Another option is to use a thermometer probe, which can be clamped to the grate, and will give the most accurate reading of the temperature at the cooking area. Of course, this is another important metric to give some thought to. Manufacturers will often include the areas of side and warmer burners in advertising a grill’s area in square inches. But the primary cooking area is the important number for planning purposes. To calculate the primary cooking area, simply multiply the width by the depth of the grate to find the total number of square inches. For example, a primary grate that measures 24” wide by 12” deep = 288 square inches of total grilling space for the main cooking area. Knowing the area is important if you plan to use the grill for entertaining, or cooking for more than two people. 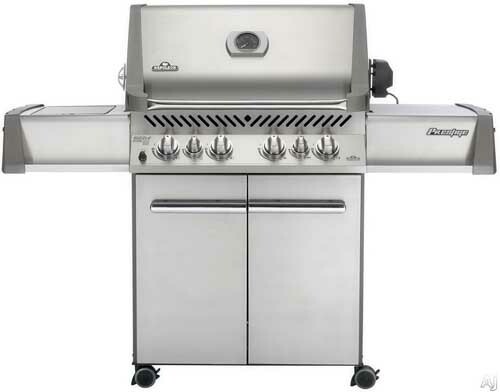 At 580 square inches, the Weber Summit S-470 Stainless-Steel Gas Grill is one of the largest models. A good rule of thumb is to allow an area the size of a dinner plate for each person – so, a 9 x 9” plate gives an area of roughly 64 square inches per person. 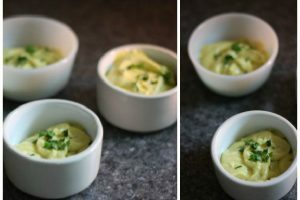 You also want to allow half an inch of easement between all pieces for even cooking, and easy turning. So, if the average 4” burger patty takes up about 12.5 square inches, adding a 1/4” easement around all sides bumps up the area to about 16 square inches in total. The full size of the barbecue should also be taken into consideration, as these can take up a significant area of your patio. If space is an issue, consider the more compact models with drop-down side shelves that decrease their footprint. Attachments of this sort are a sweet feature if you enjoy cooking whole poultry or roasts on the Q. Some grills will come with the motor and forks for a rotisserie kit, but quite often it’s offered as an extra feature. Typically available on larger models, such as drawers for utensils, warming racks, extra storage space, and pull-out grease traps. Almost always sold separately, they make great gifts for those hard-to-buy-for types! 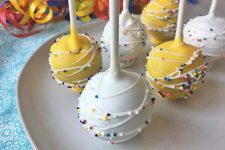 A standard utensil set will include a long-handled fork, tongs, and a spatula. A long-handled brush to clean the grate is also a barbecuing must, and may or may not be included in a utensil set. An oven mitt or a set of heat-resistant hand protectors is always a good idea. A BBQ thermometer is an essential, if you want to accurately gauge the doneness of whatever you’re cooking. 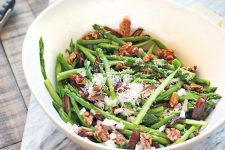 Grill baskets make grilling fish and smaller veggies a breeze, like for this grilled veggie salad for instance. A metal pizza stone along with pizza peel are other handy accessories for the Q, particularly for preparing whole fish, flatbreads, and grilled pizza. Griddles and woks for the grate also make good additions to your accessory set. A cover will help to retain the finish of your BBQ, and keep it clean of dust, sap, dirt, and bird droppings. They also keep the rain off, which protects against rust. A spare, full tank of propane is a great investment for LP models. Having one on hand will prevent the disappointment of running out of fuel before your meal is ready. Always remember to turn off the tank valve and burners before switching tanks, and take care to ensure that you have adequate space to access the tank without touching the hot grill. Now that we’ve covered fuel types, infrared grills, and features of note, let’s move on to reviewing some of the more popular models in today’s marketplace. Please note that all of these grills will require at least some home assembly when purchased online. The Weber Genesis E-310 easily gets the nod for Best Value and Performance in a Gas Grill. Thoughtfully designed with the user in mind, the Genesis E-310 repeatedly serves up satisfying results, thanks to its robust construction and materials, keen quality control, long lifespan, and top level customer service. It’s a very popular choice with online shoppers. The Weber Genesis is a legend in the grilling world, and the E-310 is one of the most popular with both offline and online purchasers. With some slight design modifications from older models, the control knobs have been moved from the side to the front panel for easy heat control – this has also freed up space for two extra-large side tables, made of stainless steel. The fully enclosed cart below the cookbox has stainless steel doors and houses a 20-pound LP tank, keeping it nicely tucked out of sight. And with the handy fuel gauge, you always know at a glance exactly how much fuel remains. The cookbox, made of cast aluminum, is strong and durable. It requires only minimal care and maintenance to keep it in top shape. Designed for efficient air flow, the shape of the cookbox and enameled lid can withstand any grilling heat, and it circulates heat evenly when cooking with either direct or indirect heat. And the built-in temperature display gives an accurate readout of the grate temperature when the lid is kept closed. 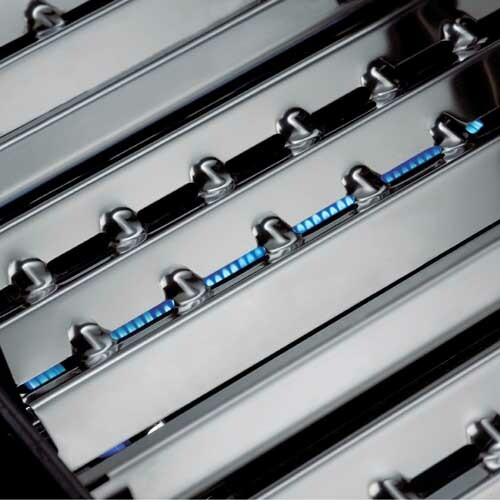 Three robust burners made of high-grade stainless steel are controlled individually for three-zone cooking, and the electronic ignition system means fast and reliable ignition every time. Each burner is constructed from a single piece of steel with no welds, for outstanding resistance to rust and burn-through. The angled flavorizer bars, originally created by Weber, are designed to catch and vaporize drippings, returning flavor to your food. And any excess drippings are funneled away from the burner tubes and into the grease trap. This protects the burners from getting clogged, and helps to prevent flare-ups as well. The grease trap consists of an angled grease tray that channels drippings into a catch pan, which is located below the cookbox in the cabinet – a safe distance from the burners. Easy to access, you simply slide the tray out when the disposable catch pan is getting full, and replace it with a fresh pan. The porcelain coated tray is easy to clean with warm, soapy water and extra pans can be locally or online.. The cooking grates are made of rugged and durable porcelain-enameled cast iron for superb heat retention and consistent, even heat distribution that results in a beautiful sear. The porcelain makes them easy to clean, and there’s no need for seasoning the cast iron. The heat deflectors are porcelain enameled as well. The primary cooking grate measures 507 square inches, plus a warming rack with another 130 square inches of surface area. The E-310 offers 38,000 BTU for a heat flux of 75 in the primary cooking area – decent energy for browning and searing. Four swivel casters make it easy to move the grill for storage or cleaning, and the front two have a locking feature to ensure safety and stability. Six tool hooks give ample room to have all your accessories on hand when you need them, and this model is also compatible for a rotisserie. The electric, counter-balanced rotisserie, which is an is available at extra cost as an accessory (seet it on Amazon), fits into the center notches on the flanks of the cookbox, and will accommodate a whole chicken or roast with ease. The E-310 also comes with a well-written and comprehensive instruction manual, making assembly easy and straightforward. This model measures 30 x 60 x 64.5” and weighs 170 pounds. Made in the U.S., it comes with Weber’s limited warranty that includes 5 years for the grates, and 10 years for the burners. The following notes are a compilation of the most frequent comments from verified purchasers at Amazon. 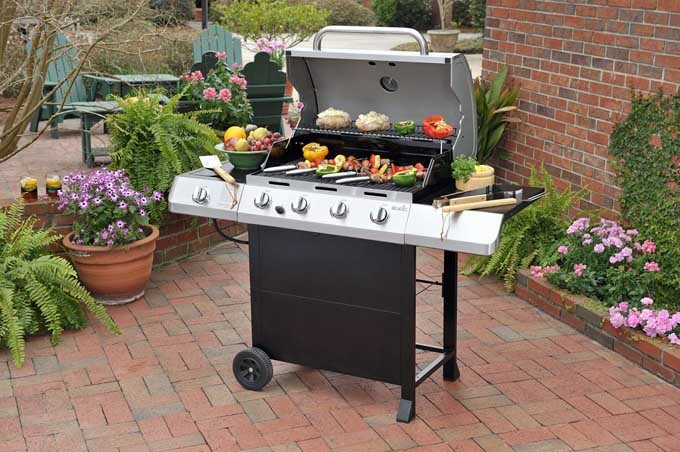 Without question, this grill is a popular one, with fans giving it top marks for solid construction using durable materials, user-friendly design, and excellent performance. Over and over, happy customers comment on the outstanding quality of all components and aspects of this model, with sturdiness and durability being favorite features. Individual pieces (burners, grates, cookbox, controls…) are constructed of heavy-duty, long-lasting materials, so each component adds to the overall solid construction. Another highlight is the heat. The E-310 heats quickly, it gets really hot, the heat is distributed evenly throughout the cookbox with no hot spots, and it consistently holds the heat – even when grilling in winter. The controls are easy to use, accurate, and have been designed with the user in mind. Consistent and reliable, many customers report buying this model to replace older Genesis grills that have lasted for 20 years or more. The instruction manual is very clear and straightforward, making assembly an easy task in about 2 hours. Customer service and support are also top notch, with replacement parts and help that’s easy to access. With just a handful of complaints, the only common theme involved two issues with the regulator and hose unit – which Weber replaced. One person reported a leaky regulator, and the other a leaky hose. 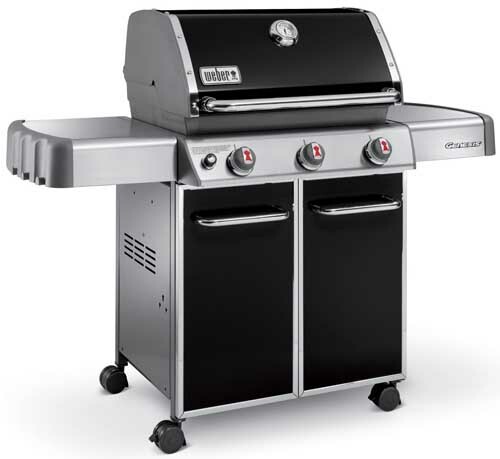 Solid and durable, the Weber Genesis E-310 is an outstanding performer in the world of full-sized gas grills. 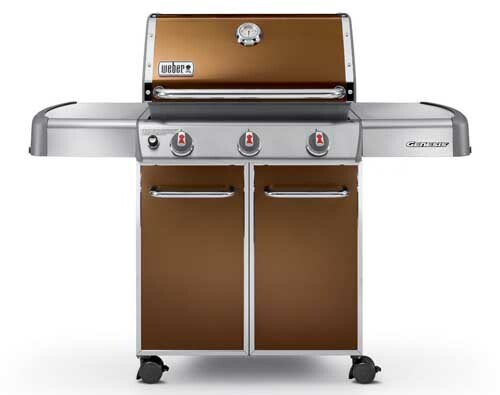 Built with high-quality materials, each carefully designed feature adds to the grill’s overall execution, and delivers consistent, reliable results year after year. Quality control, customer service, and made in the U.S. workmanship all add to the E-310’s sparkling reputation, and make it a pleasure to use. With a middle of the range price point, the outstanding longevity and steady results of this model make it a worthwhile investment for grilling fans. This model is available for delivery from Amazon where you can order it online and save a trip to the store and the pain of lugging it home. Check prices and read all of the amazing customer reviews on Amazon now. The Char-Broil Classic takes the top spot for Best Economy Gas Grill. Sturdy and reliable, the Classic offers the performance and value usually found in higher-priced units. A consistent favorite with online shoppers, it’s a reliable option for small families looking for a quality product that won’t break the bank. From Char-Broil, another well-known name in the grilling world, the Classic features four powerful main burners constructed of stainless steel, each with individual setting controls for quick heating with even distribution. And, with the built in, battery-operated electronic ignition, you get a reliable spark with every push. The cooking grates are constructed of durable porcelain-coated cast iron for great rust resistance, and the enamel makes cleaning easy as well. The primary cooking area over the four burners measures 480 square inches with an output of 40,000 BTU, for a heat flux of 83 – which is more than adequate for the high temperatures required for searing and browning. Plus, the porcelain-coated swing-away warming tray adds another 180 square inches of surface area. A flush-lidded side burner can be used to create sauces or side dishes, and gives another 10,000 BTU. When not in use, this can be used as a table top with the lid down, similar to the shelf on the right-hand side. Both the lid and shelf have a painted metal surface for an easy-to-clean workspace. The stylishly-designed lid, handle, control panel, and fascia are all constructed of durable stainless steel, for excellent stain and corrosion resistance. Other features of note include a conveniently located lid-mounted temperature gauge to track pre-heating, and to monitor the temperature of the grill – bearing in mind the lid needs to be kept closed for any accuracy in temperature readings. Two sturdy wheels on an axle make the Classic easy to move and maneuver. And a grease cup hangs from a holder at the bottom of the grill, keeping the firebox clean. Easy to assemble, the Char-Broil Classic is also rotisserie compatible. The assembled grill measures approximately 56 x 21 x 45.5” and weighs 114 pounds. Made in the U.S., it comes with Char-Broil’s limited warranty that includes 5 years for the burners, and 1 year for the grates. The following comments are a compilation of the most frequent remarks from verified purchasers at Amazon. 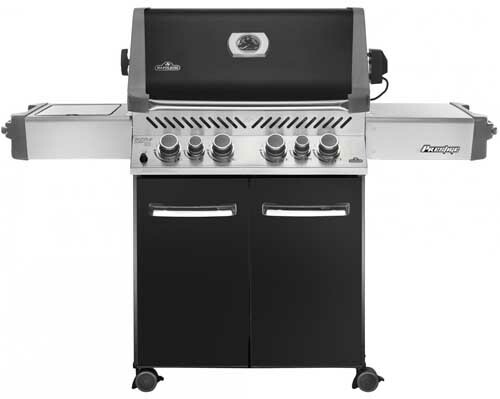 At the time of this writing, the Char-Broil Classic is one of the most popular gas grills with online shoppers – they give it high grades for solid construction, quick heating, and great value for the price. 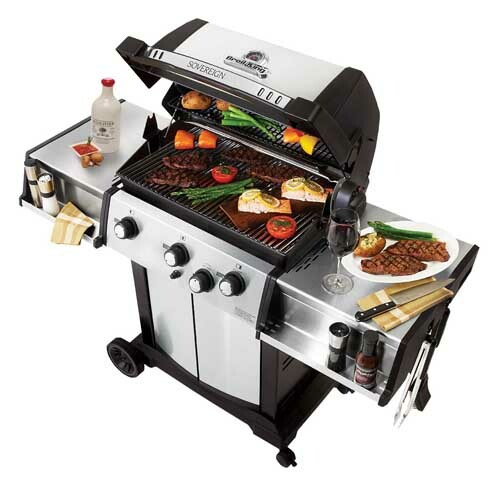 When assembled, the grill is sturdy and comfortably heavy, with all components in combination creating a solid unit. With good pictorial instructions, the grill is easy to put together in about an hour by one person, and pieces fit together well, tightening down without any hassle. The main and side burners are solid and well built, as are the grates, lid, and firebox. And the grates and deflectors are simple to remove for cleaning. Quick and even heating is another highlight, with a fast and easy ignition. And many users report that the temperature display is accurate as well. With a reasonable weight that provides stability, the large wheels are strong enough for easy rolling. It provides very good value for the money, and is durable for the price. Temperatures can be difficult to regulate. Low temperatures can be difficult to achieve, and it often runs too hot overall, or has spotty heat distribution. There are also a number of complaints about the ignition not working after assembly, or giving up after a short amount of use. And, the Classic is constructed of thin materials with burn-through occurring most often on the burner deflectors and the firebox, over varying amounts of time. A very popular model, the Char-Broil Classic meets the needs of a large majority of users who use it frequently and with good results. It is constructed of lighter weight materials than others in our review, so its lifespan will be shorter as well – but, it’s also at the low end of the price scale. With good value for the price, it offers reliable grilling performance for a family of four, and is an affordable option for the budget-conscious. Get the current price and read more customer reviews on Amazon now. 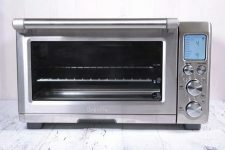 From Broil King we have the Sovereign 70, a robust and handsome grill that includes a premium rotisserie burner and kit that includes a counter-balanced fork and electric motor. 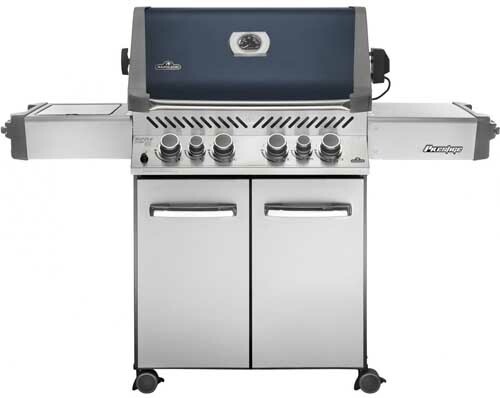 With four stainless steel dual-tube burners, individual electronic dual-electrode ignition system, linear flow valves, and a stainless steel rear rotisserie burner, the Sovereign gives outstanding precision control for multiple-zone cooking. The deep cookbox is made of heavy cast aluminum and the lid has a stainless steel insert. 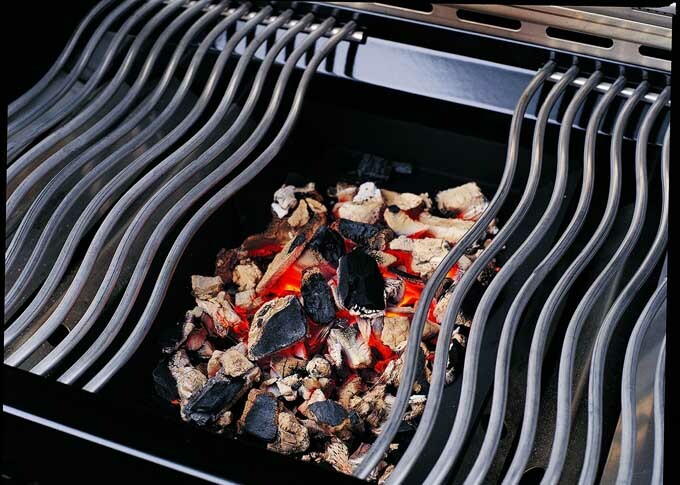 Together with the stainless steel cooking grids, this provides superior heat retention for great results. The rugged cooking grates are constructed of solid stainless steel, as are the flavorizer heat partitions that safely drain drippings away from the burners and keep flare-ups to a minimum. More durable stainless steel is found in the control panel, the extra-large drop-down side shelves, and the spacious, fully enclosed cabinet base. With 450 square inches of primary cooking surface and 44,000 BTUs from the main burner, heat flux is a hefty 98 – providing all the heat transfer needed for superb searing results. The rear rotisserie adds another 18,000 BTU, while the porcelain coated warming tray adds 275 square inches of surface area. Other features of note include two 7” crack-proof wheels and two 2.5” locking casters, a deluxe thermometer with a sensor probe that reaches deep in the oven for more accurate cooking surface temperatures, tool holders and condiment bins, powder coated black epoxy paint on the trim, and a 10’ natural gas hose. The Sovereign measures approximately 50.5 x 24.5 x 56.5” and weighs 148 pounds. Made in the U.S., it comes in a liquid propane version OR a natural gas version, so make sure that you order the right one. Broil King offers a lifetime warranty on the cast aluminum components, 10 years for the burners, and 2 years on the remaining parts and paint. As there are only a handful of reviews from verified purchasers at Amazon.com and they’re all favorable at this time, we also checked reviews for this model from purchases made directly from the manufacturer, to get a better feel for the product from a greater number of reviewers. 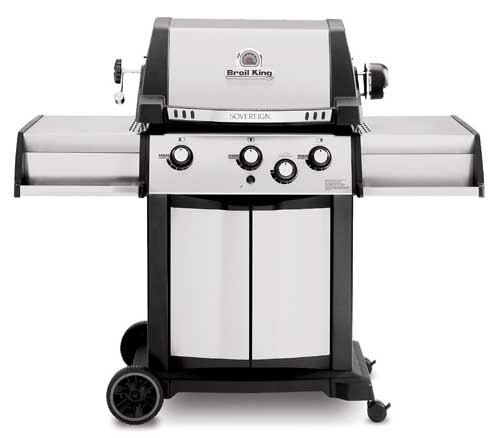 The Broil King Sovereign is a well-loved model that gets top marks for above-average quality of materials and construction, accurate and even heat distribution, and longevity of the grill. With cast aluminum and stainless steel components throughout the grill, the rock-solid Sovereign is a cut above its competitors. Burners, grates, deflectors, the cookbox, ignition system, temperature gauge, and the rotisserie all perform as expected for a high-end model. It also lights instantly and easily, and reaches high temperatures quickly. Plus, the cookbox itself holds the heat very well, and takes quite a while to cool down after shut off. The rotisserie is another highlight, as the motor and burner perform beautifully when grilling whole chickens, and the rest of the grill is engaged with other duties. Temperature control is another favorite feature, as the Sovereign can blast out the heat for a good sear, but can also be turned down low for delicate items like fish and veggies. And it proves to be rugged and durable as well, with a good lifespan. A few owners report using the grill over several years – and often in chilly northern regions like New York, New England and Quebec that experience extreme wintery conditions – without any loss of performance or deterioration. Customer service also seems to be good, with parts being replaced promptly – although one reviewer mentioned that they did not have the same easy experience. The only common complaint is that assembly was a little difficult, due to somewhat inadequate instructions. However, there is a video for this model that makes assembly easier to achieve, which shows it being put together by one person. 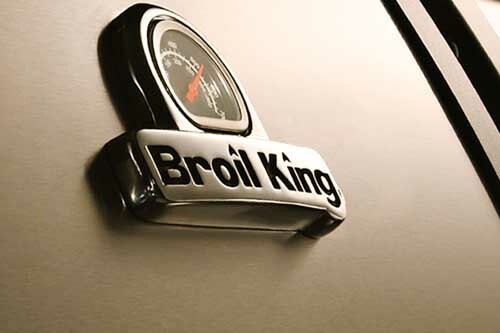 Without question, the Broil King Sovereign is a high-quality model constructed of heavy-duty materials from a well-executed design. And while this particular model is natural gas, it can still be moved for storage or cleaning, thanks to the included 10’ NG hose. 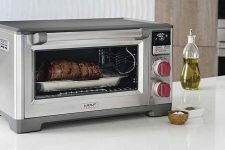 It admirably performs all of the tasks you’d expect from a higher priced unit, and the smooth-functioning rotisserie kit gives additional value. Well suited for those who don’t mind paying more for more for hassle-free operation – and who expect the value to match the price tag. Check prices and read customer reviews now. Dyna-Glo brings us a good compact option, their Smart Space gas grill – so you can enjoy all the benefits of a full-sized grill without sacrificing precious space. The grill’s space-saving design and drop-down side tables make it ideal for smaller decks, patios, apartment balconies, or any spot where elbow room is at a premium. Three straight burners running front to back are constructed of commercial grade stainless steel. These deliver performance and durability, and multiple cooking zones. The protective heat tents are stainless steel as well, efficiently returning flavor to the food and reducing flare-ups. The lid is constructed of double-wall stainless steel for extra heat retention, and includes an easy to read temperature display, while the sturdy firebox is made of porcelain-enameled steel for strength and longevity. Cast iron grates provide outstanding heat retention, and their porcelain-enameled finish transfers heat directly to the food. It’s an ideal medium for searing, and locking in food’s natural juices. And, the high-gloss finish makes cleanup easy. The pulse ignition system features an easy-push electronic button that ensures quick start up, while the chrome infinite control valves give temperature flexibility for the best possible results. With 36,000 BTUs, these components all work together to ensure fast, high, and consistent heat for the 503 square inches of cooking space, with an adequate heat flux of 72. Other notable features include the drop-down side tables, which are made of powder-coated steel – and the integrated tool hooks and towel bars that free up even more space. Four multi-directional locking casters make for easy moving and storage. The Dyna-Glo Space Saver measures approximately 23 x 49 x 45” and weighs 76 pounds. It comes with a limited one-year warranty on all parts. The following notes are a compilation of the most common remarks from verified purchasers at Amazon. Satisfied customers give the Space Saver high marks for its compact design, fast and high heating, and easy assembly. Compliments abound for the Dyna-Glo’s full-size grilling abilities in a small package. The overall design with the drop-down shelves makes it ideal for small spaces, and the multi-directional casters make it easy to maneuver into tight corners when not in use. 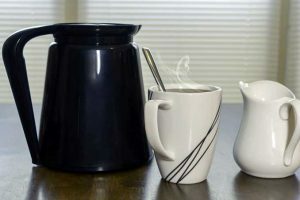 The Space Saver also heats quickly, and reaches hot, searing temperatures with ease – and for the most part, users report even heat distribution as well. The infinity valves adjust to lower temperatures nicely, giving good results when grilling more delicate items like fish and veggies. It’s also easy for one person to assemble, taking about 60-90 minutes. Components like the grate and drip pan are easy to remove for cleaning, and the cabinet is good for out-of-the-way tank storage. The materials used are on the flimsy side, so misalignment and bent parts are common complaints. And, some parts rust and burn-through occurred for users over a short timespan – particularly for the burner heat tents and drippings pan. This brings up the difficulty of finding replacement parts. Many report that the manufacturer doesn’t offer replacements, which understandably leads to some frustration. The Dyna-Glo Space Saver offers the cooking power of a full-sized grill with a minimal footprint – and the smart design frees up space for storing when the grill isn’t in use. However, don’t expect this model to offer years of problem-free service. The very limited warranty, lack of replacement parts, lightweight materials, and low-end price tag make it clear the Space Saver is intended to have a short life span – but, it seems, this model is capable of doing a pretty good job while it’s around. Good for the cabin or small balconies, it delivers decent performance, and is an economical option for those that want a larger grilling area than what portable models give. 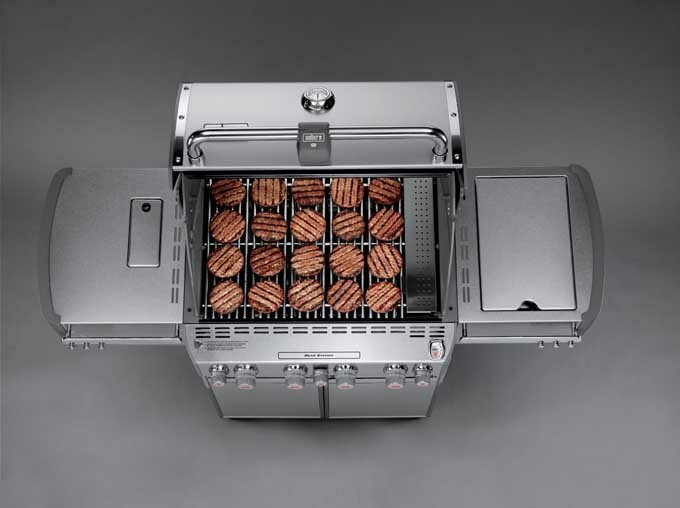 The Napoleon Prestige P500 takes the honors for Best Grill with All the Bells and Whistles. With its infrared burners, reliable rotisserie, and quality construction, The Prestige P500 is designed to provide a grilling experience a cut above the average. Unique features and high-caliber materials complement the stylish design, while its smooth functionality make operation a pleasure – ideal for summer entertaining. Napoleon is another popular maker of quality grills, and the bold Prestige 500RSBI has all the bases covered in its total package. A cart model grill constructed of durable stainless steel and cast aluminum inside and out, it has all the capabilities of a full outdoor kitchen. The Prestige 500 has 4 main burners, 1 infrared rear burner, and 1 infrared side burner all constructed of durable stainless steel, giving multiple cooking zones. And the trademark Jetfire ignition starts each burner individually for reliable startups, every time. The same high-quality stainless steel used for the burners is also found in the sear plates and the cooking grate. The 7 staggered sear plates allow drippings to vaporize, returning delicious flavor to your food. And their design makes them easy to clean, as there’s nowhere for the food to collect. More solid stainless steel is found in Napoleon’s trademark Wave Rod cooking grids – designed with a wave pattern for superb even heating. Their design also prevents smaller bits of food from slipping through the grate. The roll-top lid is also made of stainless steel, and along with the cast aluminum cookbox, holds in heat for oven-like performance. 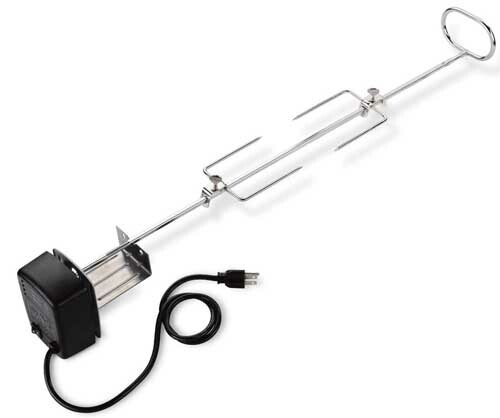 A heavy-duty rotisserie kit is part of the package and includes the motor, spit, counter balance, and two forks for cooking whole poultry. It roasts over the rear infrared burner, which is mounted above the grate along the back of the cookbox, and is for dedicated rotisserie cooking. One of the side shelves holds Napoleon’s infrared Sizzle Zone side burner, which heats in seconds to nearly 1,800°F. Give your steaks (even your lesser-known, non-traditional steak cuts) the perfect sear to lock in juices, then transfer to the main grill to finish it off over indirect heat – just like steakhouse cookin’, pardner! If you like to add a little smoky flavor, simply fill a smoker tube with wood chips and place it over a lit burner. 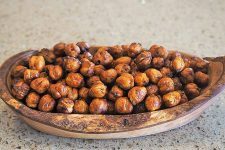 Or, if you prefer the taste of charcoal, fill up the charcoal smoker tray and place over your gas burner – you’ll be grilling on coals in no time. The charcoal tray must be purchased separately. 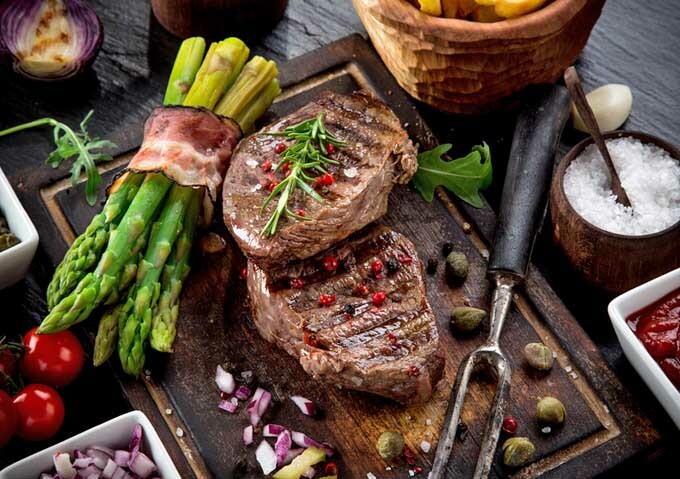 The main grate offers 500 square inches of cooking surface at 48,000 BTU – that’s a sizzling heat flux of 96, for outstanding heat transfer to brown and sear any protein. The rear infrared rotisserie burner adds another 18,000 BTU, and the infrared side burner has an area of 140 square inches with 14,000 BTU, for a heat flux of 100 – top of the line heat transfer here as well. Plus, there’s a porcelain-coated warming rack with another 260 square inches of area. Generously sized side shelves are made from high-grade stainless steel as well, and have trays for condiments or drinks, chrome towel bars, and six accessory hooks. The fully enclosed cabinet houses the included propane tank holder, and these doors are made of stainless steel too. Other features of note include a drip pan that’s easy to access, and a handsome pedestal base with hidden locking casters. The Prestige P500 measures approximately 50 x 65 x 26.5” and weighs 191 pounds and is made in Canada. Available in natural gas or liquid propane, it comes with Napoleon’s lifetime warranty on the lid, cookbox, and grates – 10 years for the main burners, 5 years for the infrared rotisserie burner and sear plates, and 2 years on the rest. It also comes with a clear and well-written manual, and the Prestige All Season Cookbook. The following remarks are a compilation of the most frequent comments from verified purchasers at Amazon. 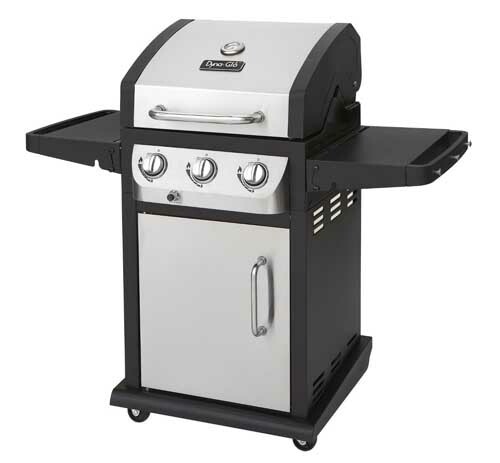 The Prestige is another favorite with shoppers who give it top-notch grades for the high quality of materials, outstanding grill performance on all burners, and exceptional versatility. The fit and finish of this model shows professional workmanship throughout, as well as rigorous quality control. The rotisserie kit works extremely well, as does the infrared burner dedicated for rotisserie cooking. And the infrared side burner gets kudos all around for superb searing, and fuel efficiency. Along with the rotisserie and side burner, the multiple cooking zones, smoker tubes, and the ability to use charcoal all make it a very versatile grill that gives superb performance in all areas. All of the main burners work well, with fast and even heating – with no problem areas or hot spots. Assembly is reasonably easy to do in about 2 hours, as the cooking unit is mostly pre-assembled. But you’ll want a second pair of hands to place the cooking unit, as it’s pretty heavy. And customer service is quick and responsive too – replacement parts arrive within a few days. There’s only one critical review from a verified purchaser at this time, so no common deficiencies are apparent. The Napoleon Prestige lives up to its name and delivers an elite level of versatility, performance, and value. 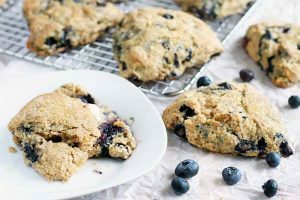 It’s well-loved by those who enjoy having a full complement of cooking styles for their outdoor grills, and who appreciate top of the line construction and materials. With the high end price tag, this model won’t be the best fit for everyone. But if you’re looking for premium quality, exceptional results, and a long lifespan, the Prestige won’t disappoint. Holland Grill brings us the latest in their line of gas cooking systems, the Liberty. Solid and sturdy, design aesthetics take second place to delivering great cooking performance here. The Liberty features a cast iron burner with a stainless steel deflector plate that distributes the heat evenly, and an aluminum sizzle tray that guarantees it will prevent flare-ups – and it enhances the flavor of your foods by returning moisture. The stainless steel lid and cast aluminum firebox are powder coated for durability and a long life, and these hold in heat for a variety of cooking tasks – you can grill, steam, slow cook, smoke, and even bake desserts with amazing results. The dual smoke stacks in the lid provide just the right amount of ventilation so your foods cook evenly on all sides, without exception. The smoke stacks pull air into the grill for heating and circulation, and allow heat to escape for convection-style cooking, while also evenly maintaining the one-temperature setting. 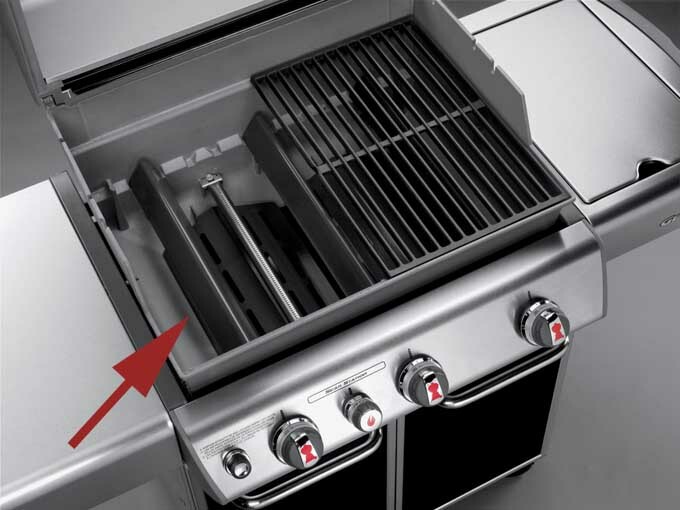 “One-temperature setting” means there are no variable temperatures – the grill is either on or off. It’s designed to cook at approximately 400°F, what Holland considers a “medium” temperature. With a rotary spark ignition system and a one-temperature setting it delivers 20,000 BTUs to the 421-square-inch cooking surface for a heat flux of 48 – perfect for the built in smoking tray and slow cooking/steaming feature. But, with this low heat flux and only one temperature, most browning and searing functions won’t be an option. Holland’s custom drip pan (i.e. sizzle tray) comes with a conditional No-Flare Warranty, and is the only brand to guarantee such a feature. The Liberty stands on four steel legs with two large wheels for easy mobility, and it has a bucket grease pan that hangs under the cookbox, as well as two side trays. It measures approximately 49.5 x 48 x 24” and weighs 84 pounds. Made in the U.S., it comes with a lifetime warranty for the burner and cooking grid, and 3 years for burn-through. 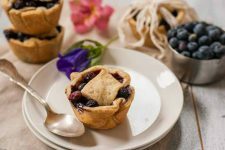 There aren’t a lot of reviews available, but the Liberty certainly gets top grades for longevity, and healthy cooking with no flare-ups. 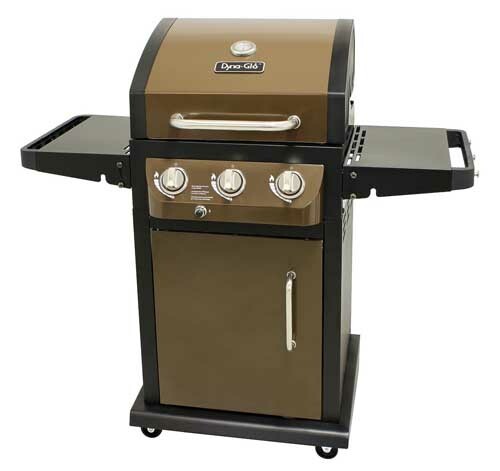 Like the other models from Holland Grill, the Liberty is built to last with stainless steel fasteners, and heavy-duty construction. Many shoppers are repeat buyers who report their first models lasted over 10 years. The other main point is how moist and succulent meat that’s cooked in it turns out. The sizzle tray returns juices and flavor without any flare ups for very healthy grilling results, thanks to the indirect flame. The only common remarks on the downside are that it’s a challenge to put together, with lots of nuts and bolts. 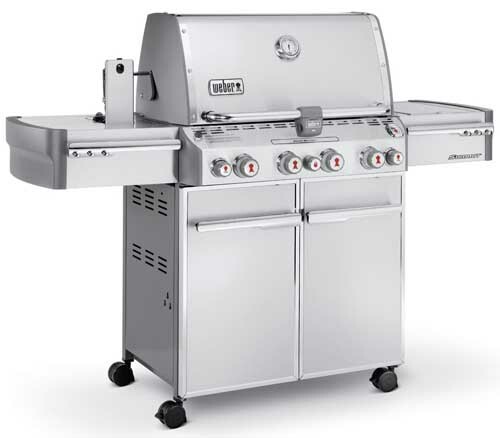 The Liberty will never make the cover of any style magazines, but it’s a rugged and durable performer that offers unique cooking features for an outdoor grill. Perfect for those who want to enjoy the healthier grilling results that come from cooking over an indirect flame. The Liberty cooks with no flare-ups which means no charring of proteins or the related health issues that comes from meat inadvertently burnt on the grill. However, the low heat flux and one-temperature feature won’t suit those who like to sear their meats on a high setting. Versatile and unique, it delivers moist, succulent results with reliable consistency. In the middle range for price, its longevity, sturdy build, and high quality materials make it a worthwhile investment. That concludes our look at some of the best options in full-sized gas grills currently available for the home shopper. And for your convenience and enjoyment, we’ve also covered all the basics for you to make the most informed decision possible – fuel types, BTU’s and heat flux, construction and safety, as well as materials and components. We think that the basic but very well made Weber Genesis E-310 is probably the best choice for most people. It oozes quality and will last you for a very long time. Of course with no side burners and or other built in accessories it may be too sparse for some folks’ taste. In that case, we’d recommend that you take a hard look at the the Weber Summit S-470 model. 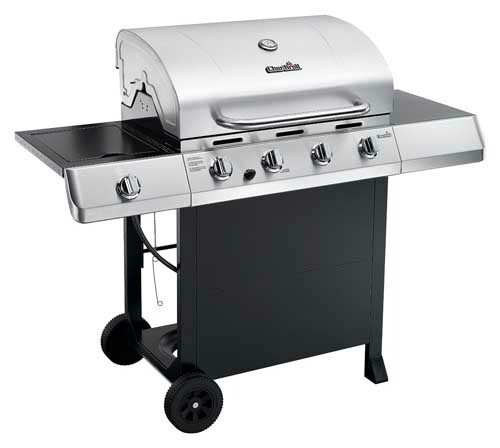 It’s got the side burners and all of the other do-dads that a BBQ fanatic could dream of. And of course, there’s the equally great Napoleon Prestige 500 that should also be at the top of your consideration list if you want a top of the line model. From budget to luxury, there’s a grill suitable for pretty much every user and all budgets. Have a closer look by following the links, but don’t leave making your decision too long. 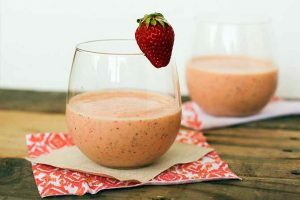 With the warm weather well under way, these high-quality performers won’t last long… and you don’t want to settle for anything less than the best! Want to know more? Check out all Foodal’s BBQ grill reviews and guides now! Wow, you know what, this article was great to read for me, and to be honest it couldn’t have come at a better time either. 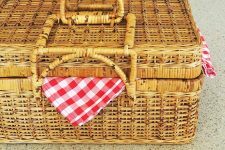 I am thinking about holding a garden party in the summer, and having a BBQ on the go is certainly something that I need to be thinking about. 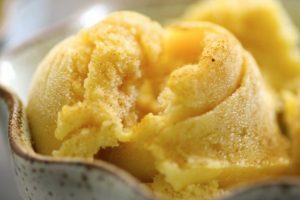 I was considering buying one but I was clueless about where I should start, and then I log onto this blog and find the ideal article to help me along my way. 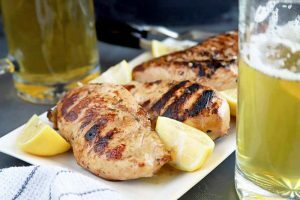 I am wary about getting a gas BBQ to be honest, but it does seem to be the most sensible option from what I’ve read here, so maybe I need to bite the bullet and just go for it! They’re perfect for garden parties Gemma, easy to use and clean up afterwards is minimal. Glad you found the post useful! What a quality evaluation and write-up for BBQ grills. For me, as someone who grills a lot of burgers frequently, one of the most important aspects is the ease of cleaning and disassemble for cleaning. I live too close to forests, so cleaning after each use is mandatory. The very first quality grill I had was a nightmare to take apart to even get the main grill off. And one of the points you mentioned, warmer areas are also important to me so you can do all the side-cooking at the same place and not have to keep running back and forth into the house. You don’t want any cookbox fires close to the woods Azrile, nice to hear you’re so conscientious about keeping the flames down! And thanks for your comments. I enjoy bbq food but we just don’t get great weather in the UK, certainly not the kind of weather where you can call up your buddies and say ‘Hey, come on over on Saturday for a bbq’ because the chances are, come Saturday, it will be pouring with rain and blowing a gale – in August. 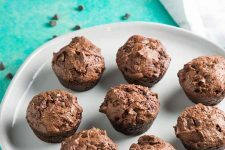 The weather can be unpredictable ukfoodiegirl, a backup plan is always a good idea! The reviews were helpful, but I wish you would have reviewed the new Weber Genesis lx models. I’m afraid it wasn’t on the market at the time of writing Guy, but it does look like a sweet model… maybe we can work it in. Thanks for the suggestion! bought Napoleon Legend barbeque for $1000 about 4 years ago. On the first day I discovered that even small wind blows the flames off due to the poor design with gas exposed to other burners. Very dangerous. After 2 years ceramic layer peeled off from the cast iron cooking grids. And all inside burner stainless steels parts were covered with rust. Stainless steel drip pan was covered with thick rust and holes. Service support refused to provide parts and service despite 25 year warranty period. I would never buy this product again and do not recommend it. I have WEBER GENESIS E-310 and I need to say that is the best on the market if you ask me. Great content!